Bethany Wilcoxon of McClure Engineering Community Planning, talks with Ackley Development Commission Director Dustin Ingram at the conclusion of the Creative Placemaking meeting on Thursday. Wilcoxon discussed the plans her company came up with for seven communities in Hardin County. A public market. A micro-brewery. A sports academy. These were some of the big-picture ideas developed by Hardin County residents working with representatives from McClure Engineering over the past eight months. Since last June, representatives from seven Hardin County towns have been meeting with McClure Engineering planners to develop a plan for future growth that would attract and retain people to the Iowa River Greenbelt area. McClure’s plan was presented to the members of those seven community steering committees last Thursday by Bethany Wilcoxon, vice principal of community planning at McClure. 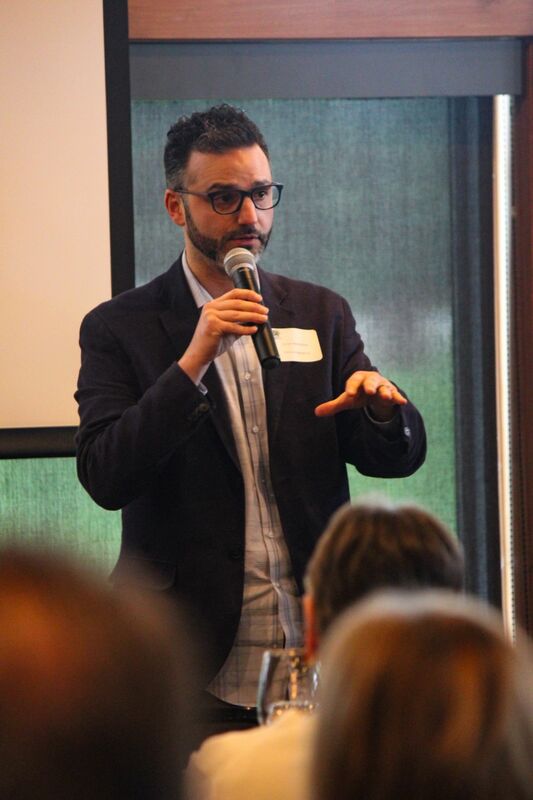 The entire project grew from a speech last spring by Zachary Mannheimer, a non-native Iowan who helped created the Des Moines Social Club before landing in his current role as a principal community planner at McClure in Clive. Before diving into the recommendations for each community, Wilcoxon spoke about McClure’s proposals for the region. A skilled trades enhancement program (STEP) would address the challenge of attracting and maintaining a workforce. While the individual community proposals were mostly quality-of-life enhancements, Wilcoxon said this would directly address business and industry needs. At the center of STEP is a debt forgiveness program that would help pay the education costs of students attending a trade school and committing to work in the county. Develop a regional brand that can be marketed. Hardin County could differentiate itself from the surrounding area by focusing on its natural beauty and outdoor recreational opportunities. best improve substandard housing and other properties, McClure suggested the hiring of a code enforcement officer who would be a shared cost between all of the towns. Iowa Falls City Manager Jody Anderson was one of those in attendance. He said he was bolstered by the report, and believes that the three ideas for the Scenic City can work. They included a revamped bowling alley, a reimagining of the former Camp David Restaurant, and a new micro-brewery. The bowling alley closed at the first of the year, while Camp David has been closed for the last few years. Both have potential to be something completely new and different in the area. Wilcoxon said the issue with the bowling alley is how to bring it into the 21st century. The plan suggests supplemental amenities to bowling. An outdoor patio area could offer things like bocce ball, a food truck, a bar, and other things to make the exterior catch the eye. Inside should be designed to accommodate such things as a restaurant and entertainment. The Camp David site, said Wilcoxon, holds even greater potential as a restaurant on one level and a “shabby chic” bar on the lower. With its location on the river and Iowa Falls proximity to water and bike trails, she said the property is prime for a revival. That could include blending retail with the food and recreation opportunities. While no location was suggested, Wilcoxon said a brewery would be a great addition to the city. Based on the growing number of breweries and taprooms in Iowa, Wilcoxon said such a facility would be unique in the immediate area. Like many of the ideas presented, a brewery could fit in with other plans like the bowling alley or the old Camp David restaurant. Like the bowling alley and Camp David ideas in Iowa Falls, the plan in Ackley also proposed a multi-use facility. The vacant elementary building has been maintained by the school district, but has been used very little since closing in 2014. McClure’s idea would turn the building into a public market in the vein of Cedar Rapids’ NewBo City Market. A locally-sourced restaurant, coupled with vendor space would take the lower level. The upper two floors would become apartments, with a mix of one- and two-bedroom units. The idea for Alden is to tap into the non-traditional economic growth area of the arts. By placing a creative center in a vacant building at 1109 Water St., the town would give residents and visitors an opportunity to express their talents. Classes could include animation, bookmaking, calligraphy, ceramics, drawing, fabric dying, jewelry making, painting, photography, sculpture and more. Unlike most of the other ideas, it was suggested that the Alden Creative Center operate as a non-profit partnership with Ellsworth Community College and local schools. With entertainment, dining and creativity checked off the list, the proposal for Eldora would add exercise. Through the creation of a sports academy, athletes of all ages would be able to play and learn about whatever sport they want, from team activities to individual endeavors. It could be a site for various camps. Another non-profit endeavor, Wilcoxon said revenue could be generated through memberships and fees. It was also suggested that the academy form partnerships with local and state schools. Other proposals called for construction of a four-plex in Hubbard, extending New Providence’s beautification toward the bike trail, and an outdoors outfitter near the river in Steamboat Rock. Wilcoxon said eac h of the ideas is meant to tie together within the county. While some could be done with relatively little expense, others could cost much more. She said the relationship between Hardin County and McClure doesn’t end with this report, adding that she is available to help answer and find solutions to concerns about cost and other things. Almost every project calls for at least a group of owners/investors.